“The mark of an Olympic athlete, at least at Rio 2016, seems to be a scattering of perfectly round bruises. Swimmers and gymnasts, particularly from Team USA, are among those seen sporting the mysterious dots. 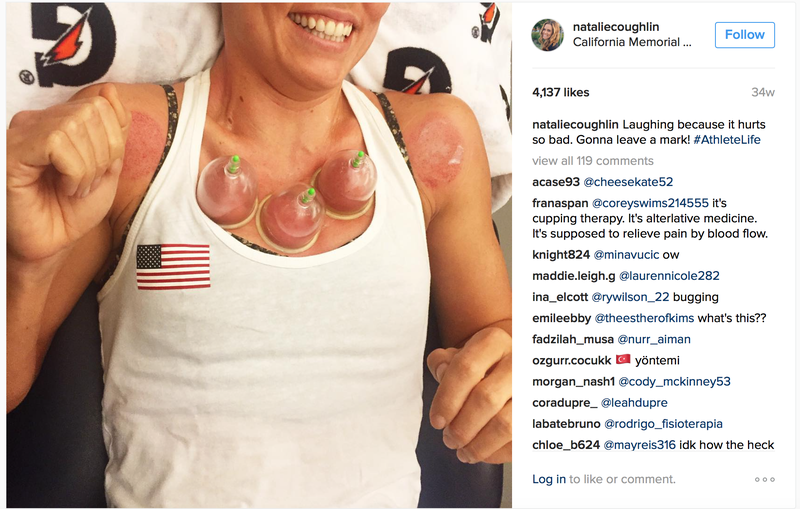 US swimmer Natalie Coughlin posted a picture of cups suctioned to her chest – with the words: “Laughing because it hurts so bad” – and a painful looking picture of the aftermath of the therapy. “it’s [sic] soothes pain and relaxes you.” Sure looks that way. Best bit of the BBC post, this classic illustration. ‘Man with Pearl Earrings’ I believe it’s called. Plenty of coloured tape on show at the Olympics too. I was surprised to learn that cupping was a treatment that dates back to the Romans: “Wet cupping involved making superficial incisions in the skin, a small piece of burning lint was then placed in a metal or glass cup and the cup applied to the skin. The burning created a vacuum and blood could be drawn. This process was also known as the artificial leech. In dry cupping, the skin was not cut, but the suction was regarded as sufficient to extract the vicious humour.” From: Roberto Margotta. Medicine and Humanism. In: Lewis P, ed. The Hamlyn History of Medicine. London: Reed International Books Ltd., 1996: 71. P.S. 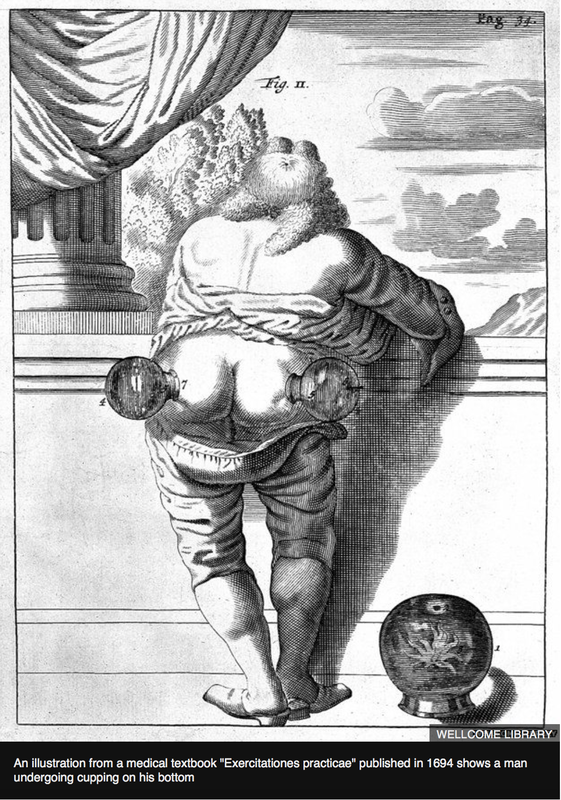 Cupping is said to be “most effective at the wane of the moon, with the weather at set-fair, preferably the 17th of the month and on a Tuesday.” From Garrison’s History of Medicine, 4th ed. Philadelphia: WB Saunders and Company 1929: 134. Talk about the Olympics rings! I reckon that cupping could negatively impact performance, especially at Olympic level. When a motor output is constructed, the brain calls upon all available references to construct the best one. One of these references will be somatosensory neurotags. The brains somatosensory representations of the cupped bits will probably be ever so slightly altered, perhaps more so due to the public’s new interest in the red spots. Without the old familiar neurotags, some sensory motor incongruence may result in a slight motor output change. Oh – and fascial sheets won’t slide quite as well with all that blood in them. It all might only change performance by .01% but that could be a gold medal. The suggestion that pain has a casual effect on body image seems to me to be an ontological miscategorisation, and the suggestion that less pain leads to decreased nociceptive input is a all a bit arse-about. Makes it hard to take any of the findings seriously!! Tim, I misled you in my post about cupping. The purpose of the lint was to collect the blood from the scarified skin. In the more common procedure, a cup was heated and applied to the skin. As it cooled, the skin was down up by the suction and the evil spirits and toxins thereby removed. I hope no Olympians were damaged by following my incorrect advice. Thanks John. Let’s hope any athletes reading this and considering cupping have also read your mea culpa! Earlier in the year, we were invited to run some courses at the Australian Institute of Sport. I had the pleasure of having some very interesting chats with some of the people undertaking research there – fascinating stuff with the ability to collect data (round the clock, longitudinal, genetic makeup, immune profiling, performance profiles, psychological self report and on and on and on) that would make most researchers salivate. I’m sure that a/the US sports institute equivalent would be undertaking work at similar level which leads to the seeming incommensurability between modern scientific research and performance maximisation and this bit of quackery with its appeals to mysticism, “thousands of years of happy customers”, the ambiguous benefits of “improved blood flow” and perhaps some counter-cultural ‘natural remedy’ thinking. The Atlantic piece http://www.theatlantic.com/health/archive/2016/08/phelps-cupsanity/495026/, said it much better than I could – the comments section there is… informative. Hey guys the “the black box” is still out there!! !